With summer on our doorstep wearing something light bright and cooler is very appealing, Uncle George just releases a new range of Bonita Kaftans the range focuses on celebrating colour, comfort and glamour. 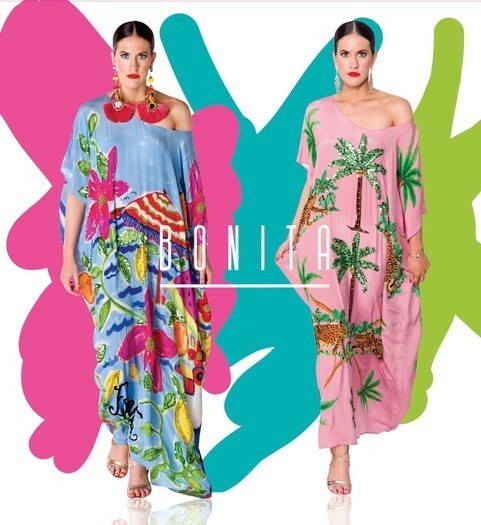 Australian based label Bonita Kaftans, launched in Spring 2015 with a focus on celebrating colour, comfort and glamour. Bonita Kaftans are inspired by ethnic, embellished and exotic textiles that translate from every day wear to evening wear just by changing accessories or simply styling it uniquely. Bonita Kaftans designer and artist Kristian Williams made waves in 2015 with his debut art exhibition Bold & Unbridled – a collection of strongly-coloured, neo- expressionistic pieces that sold out within weeks. Putting pay to the term wearable art, Bonita Kaftans feature Williams trademark bold, strong colours and designs combinations that celebrate the spectrum and nod to influences from all over the world. As wearable as they are striking, quality and comfort are both key players in the design process for each garment. Bonita garments are made from the finest A-Grade fabrics, and embellished with individually hand-sewn sequins and Swarovski crystals. Each garment is manufactured by some of India’s best artisans so as to ensure a unique product that is of the highest quality. Bonita tests the imagination thanks to our creative, bold, sparkly and fashion-forward styles available to all gorgeous women across the globe!